Dozens have been injured in a massive fire in the German town of Siegburg. Almost a dozen homes were destroyed by the flame, which was tackled by hundreds of firefighters and led to the shutdown of roads and a railway line. At least 40 people have been injured in a large-scale fire that broke out in the town of Siegburg, located some 30 kilometers south-east of Cologne, a local police department confirmed in a Twitter post, adding that at least six people sustained severe injuries in the blaze. The flame engulfed a neighborhood located close to an InterCity Express (ICE) line – a high-speed train service operated by the German railway company Deutsche Bahn – prompting the suspension of railway services between Cologne and Frankfurt as well as causing train delays of up to 90 minutes on some other lines. Police also had to block some major highways running near Siegburg for several hours. 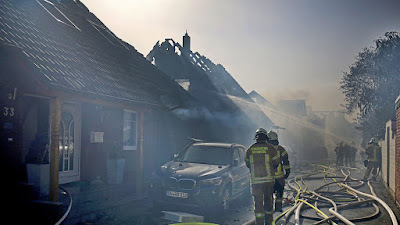 A video posted on YouTube by the local Koelner Stadt-Anzeiger daily, as well as photos from the scene, show several homes burnt out from the ground floor to the rooftop. Some eight buildings were destroyed by fire, according to German media. A slope separating the railway from the neighborhood also partly turned into a scorched-black deserted zone. More than 500 firefighters had to struggle with the blaze for hours before they finally managed to extinguish it, according to the German media. The fire fighters had to call in a helicopter and request assistance from the German Armed Forces – the Bundeswehr, Sueddeutsche Zeitung daily reported. Residents were evacuated from several neighboring homes. The exact scale of damage caused by the fire is still unclear, according to the fire department. The blaze had apparently initially started on the railway slope and then quickly engulfed the neighboring buildings due to extreme heat and drought that plagued this area for quite some time. “At 39 degrees [Celsius], that was a matter of seconds,” a fire department spokesman told German media. Siegburg authorities initially said that the fire might have been caused by a spark released by one of the trains that were passing by. Later, however, it backtracked on its statement and said that other causes are also possible. The railway service said it is still unable to provide any “conclusive statement” on the issue and warned against premature conclusions.